Immediate recognition of cardiovascular emergencies leads to less delays in treatment and a lower risk of morbidity and mortality. In this chapter, we will focus on complications of acute myocardial infarction (arrhythmia, inflammatory, and mechanical), symptomatic bradycardia, and cardiac arrest. 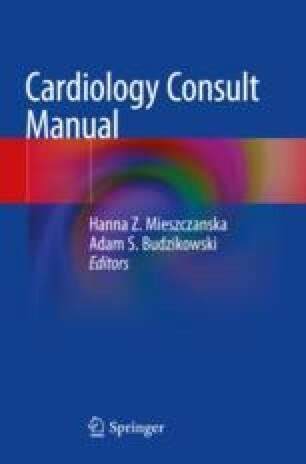 Detailed discussion on tamponade, aortic dissection, and symptomatic tachyarrhythmia can be found in separate, dedicated chapters in this pocket manual. Thiele H, Akin I, Sandri M, et al. PCI strategies in patients with acute myocardial infarction and cardiogenic shock. N Engl J Med. 2017. https://doi.org/10.1056/NEJMoa1710261. American Heart Association. Web-based Integrated Guidelines for Cardiopulmonary Resuscitation and Emergency Cardiovascular Care—Part 8: Post-Cardiac Arrest Care. ECCguidelines.heart.org.